National Garbage Day Man would like to say, “Thank You” for the excellent leadership you’ve given to the men and women of the waste industry. Through your support we are able to reach new heights. James & Ruth Contreras of RJ Recovery Inc, along with coworkers and colleagues, nominate John A. Grosso III for the 2017 National Garbage Man Day Wall of Honor. Hailing from Long Island NY, Grosso has spent his life in and around the waste management industry. Making the move to the Charlotte, NC market he has spent the last 20 years working with several waste management start-ups and family owned companies in the metro region, all while building a reputation as a dedicated and respected colleague, coworker and friend. In 2015 Grosso joined the start-up team at RJ Waste & Recovery in Charlotte, NC. 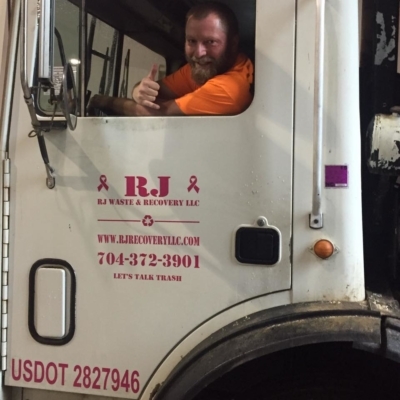 Drawing on his life long experience which includes collection, driver, sales, account management, customer service and facility operations to name a few, he has helped Jim and Ruth Contreras build RJ Waste & Recovery into one of the fastest growing private waste management companies in the Carolinas. His mission has always been to provide outstanding service to his customers while preserving the environment. A constant and consistent role model and professional, Grosso is highly respected by his industry colleagues and coworkers. With inspiration from his father, John A. Grosso II, and an education from Nichols College in Dudley Massachusetts, he has made being a garbage man into a proud and successful career. Grosso credits the strong foundation his father instilled in him for the success in both his career and personal life. It is in his memory that he has grown into the devoted husband, father and son as well as good friend and colleague. We are proud to honor him this year!